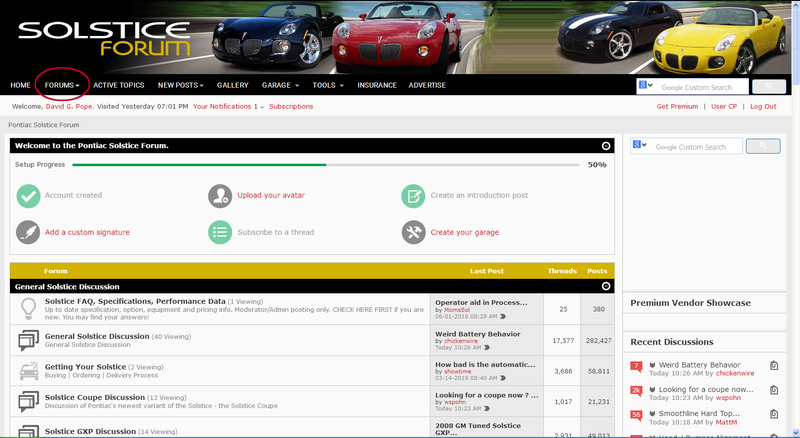 Pontiac Solstice Forum > Site Help > Solstice Forum Site Issue Forum > Who Is David G. Pope? Who Is David G. Pope? When I visit the Solstice Forum - and don't "officially" log-in - and click on the "Forums" Tab, it's showing that I'm logged in as David G. Pope. I was using the Forums page as my landing page, so every time I even checked on the forum, it's showing I'm logged in as David G. Pope. This started yesterday - and is continuing today. To properly log-in I had to re-bookmark the Home Page and log-in from there. Saveaux and Bama like this. I'm not seriously asking who the man is, I'm asking why I get his log-in when I visit the Solstice Forum. Seems to be a glitch. I don't want to be using someone else's account. I'm guessing that your account and his have been cross-linked somehow. Leave a message to @Administrator to see if it can be corrected. Today this problem appears to have been solved. We sent it up anyways to double check. Any issue with it so far? Have you cleared cache and cookies? I'm no longer getting the wrong account when I simply visit the site without logging in. As part of routine maintenance I clear the cache - and limit acceptance of cookies. So yes, they have been cleared. I am noticing that some listings in "Recent Discussions" aren't updating in "real time." For instance, when I visited w/o logging in, this thread didn't show the Admin response. However, when I went to a different thread the correct/updated "Recent Discussions" did appear. Not sure what that means, but may be tied somehow with RedOne7's database errors. Figuring out how this site works is above my pay grade. You be Da Man! Such a horrible, horrible movie. The (heavily abridged) version of the book was fun.